Responses to President Obama's State of the Union address fell largely along partisan lines. (CNN) -- President Obama returned to many of the themes from his campaign during his State of the Union address, calling for change and condemning partisanship in Washington, while maintaining an unflappable confidence that America's best is yet to come. "I campaigned on the promise of change, change we can believe in, the slogan went," the president said in his Wednesday night address. "Right now, I know there are many Americans who aren't sure if they still believe we can change, or that I can deliver it. But remember this: I never suggested that change would be easy or that I could do it alone." Despite his appeal for unity, response to his speech fell largely along partisan lines. His words left many encouraged, but others remained skeptical that this time, change would come. "It's not about rhetoric anymore ... It's about record. And that's the issue he faces going forward," said John Avlon, author of "Independent Nation: How Centrists Can Change American Politics." Obama rode into the White House on a wave of hope, rallying the base of the Democratic Party while winning over independent voters. A year into his presidency, however, polls suggest that much of the excitement has faded to disenchantment. The White House took this month's special election in Massachusetts -- where Republican Scott Brown defeated Democrat Martha Coakley to fill the late Ted Kennedy's Senate seat -- as a "wake up call," White House spokesman Robert Gibbs said. The election indicated that voters were frustrated with the way Washington was operating and that Democrats couldn't count on the independent vote. Avlon said Obama focused on the themes independent voters want to hear: the economy and the tone in Washington. "So this was, in many ways, a return to those themes that caused independents to support President Obama in the first place," he said. "There's still a long way to go. Independents feel burned by the lack of focus on these core issues. But it was a step in the right direction and reaffirming to many." But political analyst Jennifer Donahue thought the speech was "very underwhelming." "I think he threw bones to the left, he threw bones out to the right. I didn't see a lot there in the middle. I don't see a lot that's going to galvanize people who are looking for specifics on jobs, specifics on deficit reductions, an alternative to the year that's passed and something they can really get their hands around," she said. Donahue said the speech would have resonated better if it focused more on "tax cuts that have teeth" instead of deficit reduction over the next 10-20 years. "I wish he'd given the speech a year ago. I think his problem was not that he tried to do too much. In a way, it was that he tried to do too little, or the country thought he was only trying to do one thing," said Bob Shrum, a Democratic strategist. Obama made many proposals in his speech -- from doubling exports to making the government more transparent to repealing "Don't Ask, Don't Tell." He also urged Congress to press forward with health care and "finish the job for the American people." Democratic Sen. Sheldon Whitehouse said Obama's speech "gave us hope for better days ahead and a blueprint for renewed American prosperity." 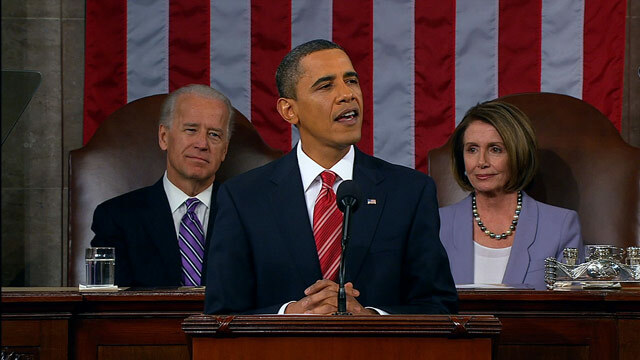 House Speaker Nancy Pelosi said the speech "lived up to his standards." Former New York mayor and Republican presidential candidate Rudy Giuliani said Obama did offer things Republicans can cooperate on, like expanding nuclear power, but he said he was disappointed with the lack of emphasis on national security. "It almost seemed to me like a footnote, like an afterthought. Very little time spent. Nothing substantive said about it," he said. "The only thing he actually said about national security is he's going to bring the troops home from Iraq in August of this year. But of course, he was going to close Guantanamo by January of this year. So who knows." The president acknowledged that his administration has had political setbacks this year, some of which he said were deserved. Prior to the speech, a CNN/Opinion Research Corporation showed that most Americans were hoping the president would use the address to move his administration in a new direction. Obama vowed to change the tone of politics in Washington, a difficult task now that it is an election year and lawmakers' jobs are on the line. To Democrats, Obama said "people expect us to solve problems, not run for the hills." To Republicans, he cautioned that "just saying no to everything may be good short-term politics, but it's not leadership." And to the country, he implored, "Let's seize this moment, to start anew, to carry the dream forward, and to strengthen our union once more."